The benefits of exercise on our physical and mental health are innumerable. Being active can help you live longer and feel better. It can improve your mood and help you sleep better. It can help you manage your weight and improve your balance. In order to become fit, there are those who proclaim the virtues of a runner's high, the intensity of weight lifting and the teamwork basketball inspires, but not everyone can participate in such high-impact exercise. This is when swimming comes into picture. Swimming is an ideal activity for people of all ages and ability. When swimming, your body is supported by water so there is no excessive stress on any one set of muscles or joints. Swimming can be done as an exercise or as a pastime that can be enjoyed all the year round. It can be carried on out-of-doors in the sea, river or swimming pools. You can swim with your family or your friends, or on your own. Very little equipment is needed and one can begin at an early age and continue for as many years as one feel inclined. Swimming is an ancient pastime and workout. Many experts believe that our ancestors learned how to swim by observing and imitating the behavior of animals that live in water, such as fish and frogs. The earliest record of people swimming is found in the Cave of the Swimmers, a cavern dating back to 4000 BC in the southwest Egyptian desert near the border with Libya. Swimming is categorized as an aerobic because even a few laps can be very demanding. It reduces blood pressure, and risk of having a stroke. It reduces your resting heart rate and increases your cardiac input. It makes your heart to pump blood effectively and efficiently. When you're aerobically fit, your body makes use of oxygen to sustain movement more efficiently. Swimming as an exercise requires all the movement muscles to co-ordinate at the same time. Water creates more resistance than air; so you need to try much hard when it comes to swimming. As a result of this you develop stronger muscles. Swimming and water exercise, when accompanied by good stretching habits, can greatly improve flexibility. The smoothness of the movements helps lengthen and stretch muscles rather than make them bulky, giving one the appearance of being more toned, healthy and strong. The buoyancy of water acts as a protective gear around the body. It takes away any excess pressure on the bones, joints and muscles. There is no harsh pounding or jerks to jolt the system. It is one of the safest and cushioned form of physical exercise a person can find. If a person suffers from joint pains then swimming is a good form of exercises for him. It is also used by physiotherapists to rehabilitate the person who has just been through an accident or a surgery. During 30 minutes of swimming it is possible to burn 260 calories. Low water temperatures also stimulate blood circulation and metabolism Because the metabolism is accelerated (even after coming out from water), the fatty reserves are reached faster than usual. 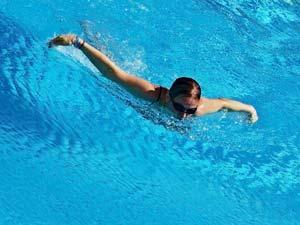 Therefore, swimming can optimally assist to your weight loss programs. Most children are very afraid of water. This fear has to be eliminated at young age otherwise it might become a phobia when he/she grows up. Swimming should be introduced in early ages to boost a child's confidence when facing water. Swimming forces you to regulate your breathing and allows more oxygen to flow into muscles. It also helps in massaging your muscles and relieves stress. Being enveloped by the warm water facilitates a calming and meditative feeling. It is also an activity that can act as a stress buster. It is a great way to socialize and make new friends. Many health clubs offer swimming facilities along with the regular gym membership. It is great way to have some laughs and get a great workout. Once you start swimming, you'll find it addictive and your body will be craving to get into the water and get moving. This is because all elements of the body get a workout in water, while the mind enjoys the rest and being at peace. So pick up a towel and a swimsuit and dive in!